Aquaphor helps to soothe during workout and post-run chafe! Disclaimer: I was provided these products from Aquaphor US to review and to provide a giveaway to my readers. I was not compensated for this post and all opinions are my own. Just last weekend Triathletes toed the line at the start of the Aquaphor New York City Triathlon to test their training and determination. The last thing any triathlete or runner would want to happen on race day would be to deal with painful chafing that often goes along with strong athletic effort. As a distance runner one of the things I dread the most is getting chafing in some of the unmentionable not so desirable areas during a long run. Summer can be the worst timesfor chafing to happen especially in this crazy humid heat wave that we have been experiencing in New Hampshire this summer. When I workout I tend to sweat profusely. It is definitely not ladylike at all. I often end up looking as though my face is a salt lick left out for the next deer who passes by. Sorry for the honest graphic description but I am guessing many of you who pound out the miles on the pavement and on trails know exactly what I am talking about but I digress . . . When I run in this heat the combination of sweat and the friction caused by my running clothes rubbing against my skin are the perfect recipe for chafing. For me the worst areas are under my arms especially the left side (do I appear crooked when I am running? HA!) as well as chafing under my the band in my sports bra (OUCH! OK . . . not sure what the guys know what I am talking about on this one.) There is nothing worse than going for the perfect long run, then hopping int he shower to get clean and refreshed only to discover painful areas of chafing when the water hits you skin (AHHH!). I have found Aquaphor Advanced Therapy Healing Ointment to be a great defense against chafing on my long runs. One of the reasons I actually like Aquaphor so much is that this is a product that I used on my kids as babies to help with diaper rash and still use it on their sweet little kid hands and lips in the winter when chapped hands and lips make for sad faces. I have sensitive skin just like my kids and I like to go with products that are all natural and/or organic when I can so Aquaphor is a great choice for me and my kids. I use Aquaphor when I run to help “cut through the chafe” in my troublesome chafing spots as a preventative measure to try to avoid chafing hot spots. When I do get chafing during long training runs or in a marathon I use Aquaphor on my skin to protect it from any further rubbing and to help my skin heal more quickly. How do you cut through the chafe during your long training runs? Do you use Aquaphor to help your skin stay free of irritation during your running adventures? Aquaphor was very generous and provided me with several full-size samples of their Aquaphor products to try, a CamelBak water bottle, and $50 VISA gift card and NOW you could be chosen as the LUCKY winner to receive an identical prize package from Aquaphor! Please enter this awesome giveaway to “Cut Through the Chafe” through Rafflecopter posted below. The giveaway is only open to US Residents who are 18 years of age or older. WINNERS for this Awesome Aquaphor Giveaway will be chosen on AUGUST 5th at MIDNIGHT. I’ve been using Aquaphor for years to prevent chafing. I’ve paid dearly when I forget to use it. I chafe between my thighs and my upper arms. Ouch! Ouch! Aquaphor is definitely perfect for healing underarm chafing! I hate chafing under my sports bra! It’s the worst when you have to put on a sports bra again to go for your next run. Aquaphor definitely helps with this! I’ve never used Aquaphor for chafing but have used it in the winter when my hands are so dry and cracked. Works like a charm to make ’em soft again! I use it on my hands too in the winter. We definitely have to deal with that every year in NH. Aquaphor is the perfect solution. I use Aquaphor on my inner thighs to prevent chafing. I’ve never had that type of chafing but I definitely know that that is no fun! Good luck! I use it on my feet for long runs. It is just so much easier than putting a stick on my toes! Your toes will be very happy if you are a winner! I’ve learned the hard way that I need something for chafing in the summer humidity! Would love to try Aquaphor! And this summer has been the worst for humidity especially now that you are living on the East Coast. I hope you are settling in! I haven’t used it for chafing but my gosh I’ve gone through so much for my life long battle with eczema. I remember as a kid when I found aquaphor.. It was a God send. I have used Aquaphor with my son when he dealt with Eczema which work super well! My daughter has problems with Eczema, as well. We have never tried it for that. She usually gets something with a prescription. We will have to try it for that. I have used BodyGlide, but keep intending to try Aquaphor (just keep forgetting to buy some!). 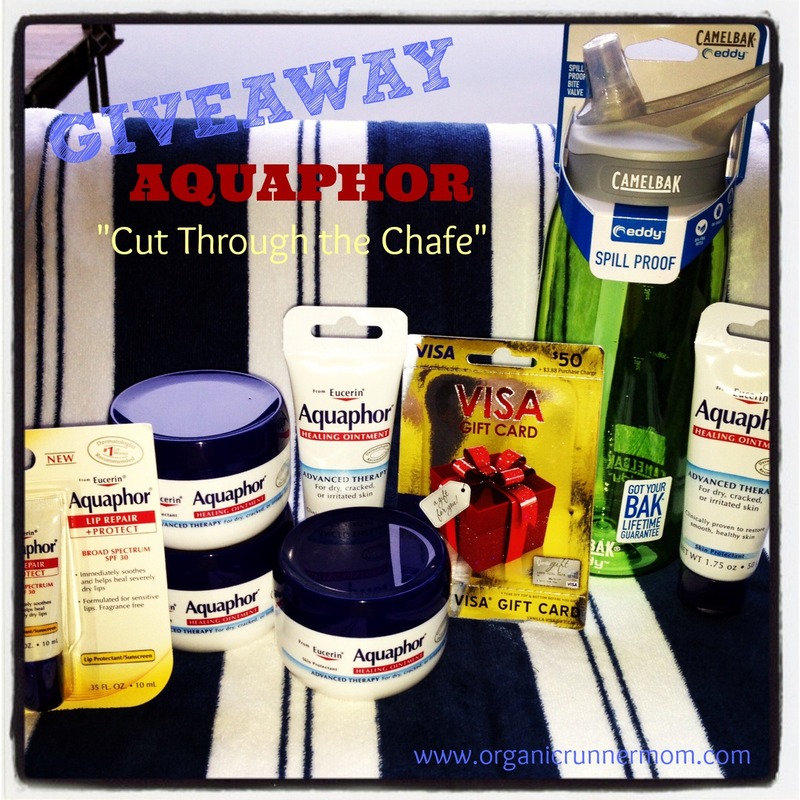 I love aquaphor and it definitely cuts to the chafe for me. I use it to prevent chafing from my sports bra and I use it as a blister prevention on my feet when I run on the trails! Blister prevention is definitely a great use for aquaphor! Congrats on your awesome finishes at Cranmore this weekend and for achieving Mountain Goat Status! You are lucky! Chafing can be super annoying.Your husband will be happy if you are a winner! my family is totally obsessed with aquaphor and it totally helps me with chapped lips whenever i do outdoor activities especially in winter time! Aquaphor is a staple in our house. My kids have eczema and sensitive skin. I use it to prevent blisters on my feet and chafing around my sports bra. aquaphor has been a life saver with preventing that annoying sports bra chafe! Aquaphor has been used for years for chafe and non-chafe related things! I haven’t experienced chafing but have been using Aquaphor for my dry skin for years. I’ve used Aquaphor before for my eczema, especially in the winter and dry skin in the summer as well. Luckily I havent had a chafing problem yet. I’ve never used it, so it would be a first for me! I use Aquaphor on my feet when I go for long runs. I use it for eczema. I apply it between my thighs when running in shorts! I use it to help prevent my sports bra from rubbing me raw!! I don’t have a problem with it, but my daughter does. She uses it often for bra chafing . I’ve only used the lotion for cases of very dry skin – usually in the NH winter! I’ve never tried Aquaphor, but curious about it. I typically use BodyGlide or RunGuard. I Always Keep Aquaphor In My Gym Bag , I Apply When Needed To Calm The Chafed Area! I have never tried Aquaphor, I keep forgetting to buy it! I’ve never used Aquaphor, but I get cracked lips and dry skin a lot, so it sounds like it would be helpful. I’d love to try aquaphor! i actually use it after runs for my tired little doggies. I don’t have problems with chafing but my daughter does, She uses it for bra chafing from sweating. Also, I posted this comment previously but it doesn’t show up on the page! I don’t currently have any remedies but it is a problem!! I could definitely use this prize pack! Thank you!